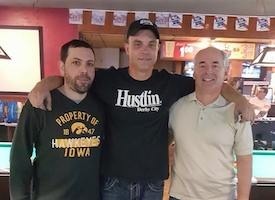 A frequent competitor over the years in the annual US Bar Table Championships, Oklahoma’s Justin Whitehead brought his small-table skills to the fourth stop on the Omega Billiards Tour on the weekend of April 29-30. Played on 8-foot tables, the $1,700-added event drew 95 entrants to JR Pockets in Denton, TX. Whitehead came within a single match of going undefeated in this most recent event. The single loss came in the opening set of a true double elimination final at the hands of Paul Guernsey, who, following a defeat at the hands of Donnie Gregory in the opening round, won 11 matches on the loss side to challenge Whitehead in the finals. Whitehead came back from the first set loss to give up only a single game in the second set and claim the event title. Left to right: Roman Bayda, Justin Whitehead, and Paul Guernsey. Whitehead’s journey to the winners’ circle was almost re-routed in the second round, when U.S. Open Champion Jeremy Jones battled him to double-hill. Whitehead prevailed, though, and arrived at a winners’ side semifinal against Chuck Dement, having given up, on average, only 3.5 racks per match (the figure would have been less than 2, had it not been for Jones chalking up eight against him). Roman Bayda, in the meantime, who, like Whitehead, had been challenged in a double hill match in the second round by the tour’s ranking leader, Rick Stanley, advanced for a winners’ side semifinal match against Crispian Ng. As is often the case, the challenges increased for Whitehead as the winners’ side matches narrowed. He downed Dement 8-5, as Bayda was busy sending Ng to the loss side by the same score. Whitehead faced his second double-hill challenge, battling Bayda for the hot seat . He won it and waited on Guernsey. Moving to the loss side, it was Dement who had the misfortune of picking up Guernsey, who was eight matches in to his 11-match, loss-side streak, which had included the elimination of Stanley, and more recent victories over Cody Wright 8-4 and Robin Barbour 8-3. Guernsey’s hopes for a re-match against Gregory fell short by a single match, spoiled by Barbour, who’d defeated Gregory 7-2 in the 9/12 matches. Ng drew Mike Nagaki, who’d just eliminated Brandon Thrasher and Albert Nieto, both 7-4. Guernsey, apparently on something of a mission, shut out Dement, as Ng downed Nagaki 8-4. In a straight-up race to 8, Guernsey defeated Ng 8-4 in the quarterfinals, and in another straight-up race to 8, gave up only a single rack to Bayda in the semifinals. Whitehead managed to slow Guernsey down a bit in the opening set of the true double elimination final, though not by enough, as Guernsey took that opening set 8-5. Whitehead dominated the deciding set, allowing Guernsey only a single rack on his way to claiming the event title. Tour Director Melinda Bailey thanked the ownership and staff of JR Pockets, as well as sponsors Michael Hoang of OMEGA Billiards Supply, FargoRate.com and OB Cues. The next stop on the Omega Billiards Tour, scheduled for May 27-28, will be a $1,700-added event, hosted by Puckett’s in Fort Worth, TX.